Three paratroopers have been shot dead in separate but similar attacks in France this week. 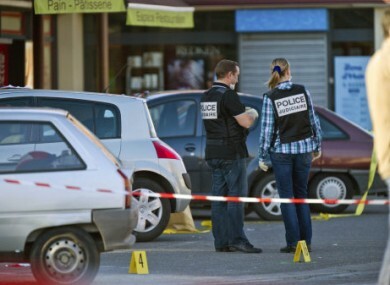 Investigators on the scene of the shootings in Montauban. AN INVESTIGATION INTO the fatal shooting of two soldiers has been expanded to include specialists on serial killers and counterterrorism, according to French officials. The two soldiers were killed and a third seriously injured as they stood by an ATM machine close to their barracks in Montauban, southern France yesterday. Witnesses said that the gunman fired from a motorbike and drove away from the scene. French defence minister Gérard Longuet has travelled to meet their commanding officer Colonel Patrick Poitou to learn more about the attack and to provide support for their unit. In a similar attack earlier in the week, a gunman on a motorbike shot a soldier dead in Toulouse. The victims of both attacks were paratroopers. Investigators are now looking into any possible link between the murders and are concerned that paratroopers are being specifically singled out for the attacks. Le Monde reports that officials have said that the same calibre weapon was used in both attacks, but noted that this does not mean the same weapon was involved. Email “French investigators consider serial killer in soldier shootings”. Feedback on “French investigators consider serial killer in soldier shootings”.